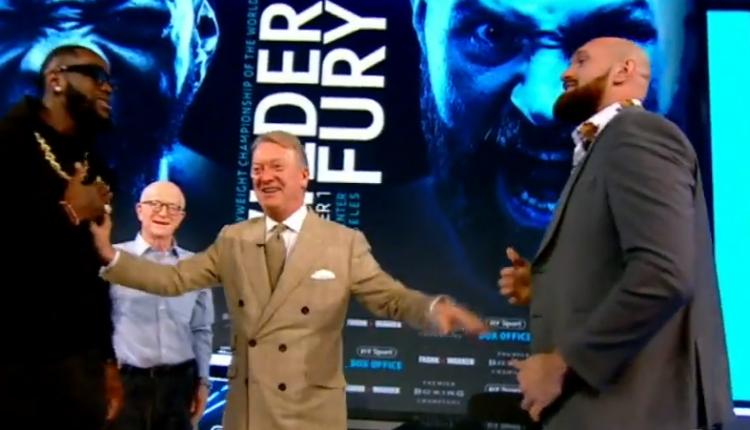 Tyson Fury says there is no question that he and WBC Heavyweight Champion Deontay Wilder can deliver the powerful shots, but Fury questions Wilder’s chin. During a press conference in the build-up to their Dec. 1 title fight, Fury told a story of Wilder suffering a knockout loss as an amateur to Evgenyi Romanov back in 2008. Wilder and Fury are both undefeated champions — Fury holds the lineal heavyweight title. Both have a majority of their wins come by knockout — 39 out of 40 wins for Wilder, 19 of 27 for Fury. However, both men have been knocked down in their professional careers. Wilder was knocked down by Harold Sconiers back in 2010, though Wilder went on to win that fight by fourth-round TKO. Wilder was also in a bit of trouble early on in his last title defense back in March against Luis “King Kong” Ortiz, but he was not knocked down and ended up finishing Ortiz. Fury, meanwhile, was dropped by Steve Cunningham in 2013 before Fury knocked him out in round seven of their bout. “[Wilder] might be able to punch, but I know he’s got a glass chin. All big punchers can’t take one back,” Fury said. “So let’s see if he can really do the talking when it comes to fighting a proper heavyweight champion of the world. It’s all right fighting bums, you big dosser. But when you fight a real man, you know to sit down. Deontay Wilder needs Tyson Fury. Tyson Fury don’t need Deontay Wilder. I chose Deontay Wilder as an easy victim, as an easy victim. Unbelievable. This is gonna be the easiest fight of my career. I said that Wladimir Klitschko would be the easiest fight of me career, and he was. Now I’m gonna say that this guy’s gonna be me easiest fight, and I predict he will.